Recently two of our viewers comments that-“Vinayak: Mera call letter aye hai. Par woh 500 rs mang rahe, tbhi call letter milega . . Kya kare hum ?” & one also comments in our fb page in the same issue. According to our point of view for the purpose of getting call letter money is not needed. MAHA AGRED (Agricultural Gramodhyog & Rural Engineering Development), Maharashtra Published Job Notification for 719 Project Manager – Field Officer & Many More Posts. Candidates who wish to apply must look at MAHA AGRED Recruitment 2018. Eligible candidates can apply offline before 15-02-2018. 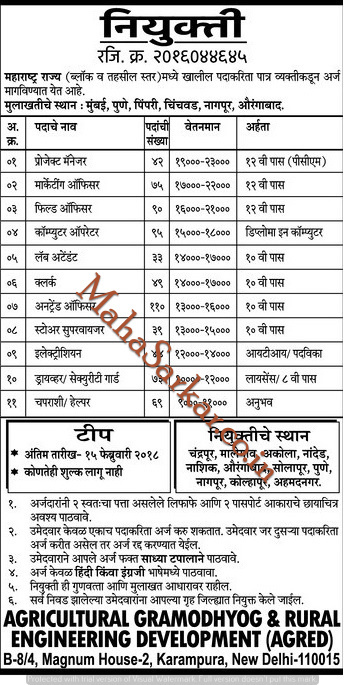 Job Location Chandrapur, Malegaon, Akola,Danded, Nashik, Aurangabad, Solapur, Pune, nagpur, Kolhapur, Ahmednagar. Education Qualification: 12th/Diploma in Computer/10th/ITI/Degree and More. For Post wise Education Details follow the detailed advertisement. Interested & Eligible candidates can send their application along with all the necessary documents and testimonials to Agricultural Gramodhyog & Rural Engineering Development,b-8/4, Magnum House2, Karampura, New Delhi-110015. Starting Date, Last Date to Apply Offline at Agricultural Gramodhyog & Rural Engineering Development which candidates should be remember as follows. Start Date to Apply Offline: 27-12-2017. Sure Sachin. Please also download our android apps from Play Store. I wish to apply for the post of Computer Operator.My qualification is Bachelor Of Engineering (B.E) in Information Technology,with last year Incomplete,whereas your requirement is Diploma in Computer.Can I apply for the post of Computer Operator ? No you cant apply on this post. B.E Qualification Job ke lia hamara portal daily follow kare, aur hamara android app download kare. sir kinldy upoad the appliccaation form. I wish to apply for the post of Computer Operator.My qualification is Bachelor Of Engineering (B.E) in Information Technology with last year Incomplete,whereas your requirement is Diploma in Computer.Can I apply for the post of Computer Operator ? Sir, How we get application form for agred post which we have to send offline…. please guide us sir…..
Vinay , please check the bellow advertisement link properly. but sir in advt. it is not mentioned about application format? Send your Bio data in English or Hindi language with 2 passport size photo before 15-02-2018 at Agricultural Gramodhyog & Rural Engineering Development,b-8/4, Magnum House2, Karampura, New Delhi-110015. I wish to apply for the post of Computer Operator. I have completed my BE in computer engineering, so Can I apply for the post of Computer Operator ? I wish to apply for the post of Computer Operator. My qualification is HSC and I m pass out from ITI with Computer Operator And programming Assistant. So I can apply for the post of Computer Operator? There is no application form needed. Send your Bio data with 2 passport size photo on or before 15-02-2018 at Agricultural Gramodhyog & Rural Engineering Development,b-8/4, Magnum House2, Karampura, New Delhi-110015. Send your Bio data with 2 passport size photo before 15-02-2018 at Agricultural Gramodhyog & Rural Engineering Development,b-8/4, Magnum House2, Karampura, New Delhi-110015. Please give some suggestion regarding application please. Send your Bio data with 2 passport size photo on or before 15-02-2018 at Agricultural Gramodhyog & Rural Engineering Development,b-8/4, Magnum House2, Karampura, New Delhi-110015. My qualification is Diploma + BE in Computer Engineering, Can I apply for the post of Marketing Officer or its only for Computer Operator ? Sir actually I was see .. in website this is a network marketing..? This is Right. Ya wrong..? I had completed ITI in Computer Operator & Programming Assistant, so can I quality to apply for Computer operator post. I had passed ITI in Computer Operator & Programming Assistant, in. 2012 with 75% & also 3 years experience in this field, so can I qualify to apply for Computer Operator post. Sir I am B.A.Final pass and 5 year experience computer operator in school and 5 year experience computer teacher ICT gov.project to computer operator ke liye Mai apply kar Sakata Hu kya. Can I send bio data by speed post?? I can send my application by speed post??? WHAT IS AGE LIMIT ? Sir this is permanent job or not ..I just want know that ..
sir advt.mai to 2 lifafe bhejne ko bola hai to kya 2 lifafe mai same documents bhejne hai kya?? Sir , experience must requir for all of posts??? I have completed my B.Sc. in computer science & I did my 12th in 2011 with 63%. I will apply for Project manager post in AGRED. But I am Fresher. So, mai uske liye apply kar sakti hu kya? & Can I send application by speed post or only for simple post…please tell me sir. Hare in Advertisement its not mention that you have speed post or only for simple post.it is your choice accordind to the last date. I have completed B.E.in computer engineering &also completed Diploma in computer technology can I apply for post of computer operator. plz tell me sir.. I have completed my M.Sc. in computer science. I am fresher…so, mera project manager ke liye apply krna chahiye ya fir field officer k liye. please give me suggestion. मेहरबानी करके ये जानकारी प्रदान करे…में गुजरात से हु तो में क्या इस जॉब के लिए मेरा आवेदन दे सकता हु…अगर दे सकता हु तो मेरा पोस्टिंग गुजरात में होगा या महारास्त्र में….. I have completed my M.Sc. in computer science.. I am fresher…so mera project manager or field officer inme se kisme apply krna jyada best rahega..please give me suggestion. I wish to apply for post of computer operator .I completed B.E. in computer Engineering & also completed Diploma in computer Technology . Can I apply for post of computer operator. Plz tell me sir. Sir me Ahemedabad ka rehne vala hun to job location likha He vha par hi job milegi ki cendided jha ka rehne vala. He vha PR milegi? Or biodeta mail kar du to chalge ? A field officer collects data, often used for research purposes. Field officers conduct surveys for a wide array of industries, from anthropology to geography, marketing, advertising and social sciences. Most turn over their findings to others within the industry to help them determine what type of work needs to be done. pls immediete replay sir. i want to type my application on that basis. sir mera bsc agriculture complete hua hai aur .seed company me marketing ka experience hai. kya mai marketing officer post ke liye apply kr sakta hu. Project manager ki post ke liye jo qualifications 12 th ke pishe PCM likha hai eska matalab kya hai. Sir project manager me kya work hoga?? The Role of the Project Manager. A project manager is a person who has the overall responsibility for the successful initiation, planning, design, execution, monitoring, controlling and closure of a project. … Most of the issues that impact a project result in one way or another from risk. Aur clerk k liye bhi apply kar sakte Hai kya graduation Hai to? I have done “Diploma in Computer Proffesonal Accountant” which is certified by govt., so can I eligible for computer operator job? Sir, Can I send only writing application? I applied AGRED job in Karnataka location on 31-12-2017.but still I am not received any confirmation from ur side regarding the job Application. Sir Mene aesahi article Gujarat ke liye bhi dekha tha to kya Gujarat me bhi vacancy he? sir, what are syllabus for all jobs? aur sir koi official application form nahi he to hum koi bhi page me application fulfill kar sakte he!!!!!!! Hello sir, ye Jo project manager k Pichhe PCM likha hai wo Kya hai? I have completed diploma in computer Technology in 2014 also completed BE.computer .so can I apply the post of computer operator. Sir maine application likhke bheja hai nd document bheja hai.chalega itna? Sir reply call me ayega ya post k through.maine mobile number likha hai.and kitte time me return reply ayega? Sir mera Bacheler of Computer Application(BCA) huaa hai to kya main computer operator ke liye apply kr sakti hu ? Sir mera Bachelor of Computer Application(BCA) huaa hai to kya main computer operator ke liye apply kr sakti hu ? Maine 18.1.2018 Ko application kiya mere ko apka reply nahi aaya sir. Interview kab hoga. Please reply sir…. So i can eligible for computer operator job ? This company is no available in given address so is it CHORE so I request don’t visit ? I am an engineering graduate. Can i apply for the project manager post. Sir mene B.C.A kiya huwa hai…or 3 saal ka computer operator ka exp. Bhi hai…to kya me computer operator ki vacany me apply kar sakta hu? WHAT IS INTERVIEW DATE. I GOT 94 % IN SSC. For more details please download our official android app from play store. Bhavik Lande ji ne ye coment kiya hai hamare facebook page par. Lekin koi bhi organaization call latter ke lia paisa nahi mangta hai. Aap mai se koi is tarah ke problem agar face kiya hai to hamko batayiyeen. Dear Pankaj, Abhi bhi koi update news nahi mila hai Maha Agred ke taraf se. job nh dena to mat do…bt logon ko fasa ke aise paise to mat mango..
SIR YE JOB SUCHE HE? GOVERNMENT YA PRAVITE? hamlog sirf job advertise publish karte hai…koi dusra kam nahi hai hamara..job dena na dena wo sab organization ke hath main hai. Envelope main kis chij ka latter hai?